FRIDAY NETWORK UPDATE: Some old business first: Nielsen finally updated its “final” Friday ratings, and as expected, the entire ABC line-up had been seriously screwed up. The actual finals for the network were 1.0 for BE MY VALENTINE, CHARLIE BROWN, 1.8 for SHARK TANK and 1.2 for 20/20, unchanged from the overnight numbers. SUNDAY NETWORK UPDATE: There were no adjustments from the overnight ratings for Sunday. NOTE: We had the same issue with the coding for TNT’s coverage of the NBA ALL-STAR GAME on Sunday that we did with the Saturday night events. 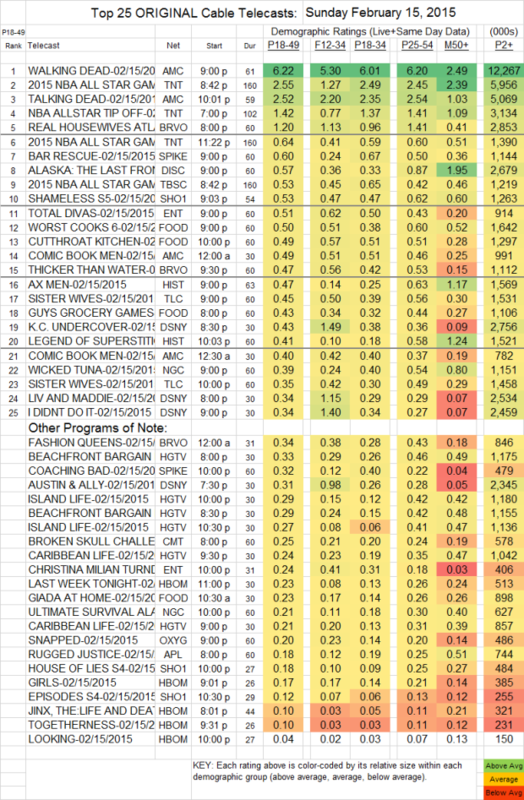 The game itself isn’t on the chart, but it had a 2.55 rating in 18-49s, with 5.96M total viewers. The TIP-OFF SPECIAL was at 1.42 in 18-49s, with 3.13M total viewers. Although WALKING DEAD towered over the rest of Sunday cable, it was significantly dented, presumably by NBC’s SNL40 special. DEAD fell 1.76 from last week to 6.22. However TALKING DEAD, which had run at 11PM last week after the premiere of BETTER CALL SAUL, rose now that it was back behind WALKING DEAD itself, up 1.03 to 2.52, and 2 episodes of COMIC BOOK MEN were at 0.49/0.40. In another compartment of the undead, Bravo’s REAL HOUSEWIVES OF ATLANTA was rock-solid at 1.20, while THICKER THAN WATER edged down 0.03 to 0.47, and FASHION QUEENS was at 0.34. On Spike, BAR RESCUE took a 0.21 leap to 0.60, and lead-out COACHING BAD was at 0.32. Discovery’s ALASKA: THE LAST FRONTIER gained 0.04 to 0.57. SHAMELESS continued to lead the night’s paycable programming for Showtime, although it dropped two-tenths to 0.53, with HOUSE OF LIES down 0.06 to 0.18, and EPISODES up a tick to 0.12. On HBO, JINX collapsed by more than half, down 0.13 to 0.10, with GIRLS down 0.04 to 0.17, TOGETHERNESS steady at 0.10, LOOKING also down more than half from 0.09 to 0.04, and LAST WEEK TONIGHT down 0.08 to 0.23 (but still looking pretty good as the highest-rated show in the Sunday line-up, which helps to explain its new 2-year pick-up). On E!, TOTAL DIVAS stayed at 0.51, but CHRISTINA MILIAN lost a tenth to 0.24. AX MEN (History) dropped 0.09 to 0.47, with LEGEND OF SUPERSTITION up 0.04 to 0.41. SISTER WIVES (TLC) gained 0.08 to 0.45.